Well, here's a fun new feature on Facebook, to end the week. Go HERE on Facebook, and activate Facebook questions. 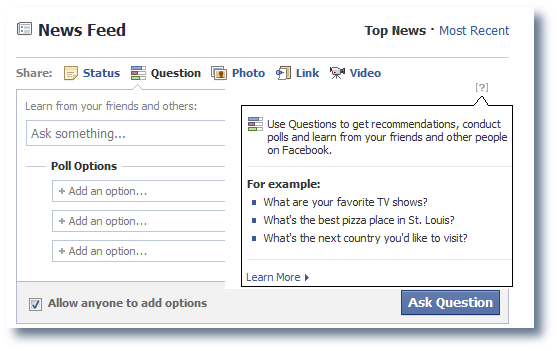 Once you do, you'll see a new option for submitting items to your profile page and news feed, called "Questions." This gives you the option to ask everyone following your newsfeed any question and to make it a multiple choice or true/false question. Your friends can answer and/or share the question in their own feeds. We noticed that people were frequently asking for opinions ("what are your favorite restaurants in New York?") or hoping to learn about their friends ("what was your favorite movie as a kid, something you watched over and over?"). For most of these questions, experts weren't going to be the best source for advice. The answers to these questions are meaningful or interesting because you know your friends and your friends know you. I added it to my feed, and above is an example of the form for setting up a question. This is easily accessible once you've enabled the feature by clicking "questions," then following the instructions. So, go ahead - find out where your friends like to eat locally, what movie eveyone's watching this weekend, or try something silly, like asking them what they think the next word added to the dictionary will be (hint: it won't be "LOL" or "OMG" - those are already in there).